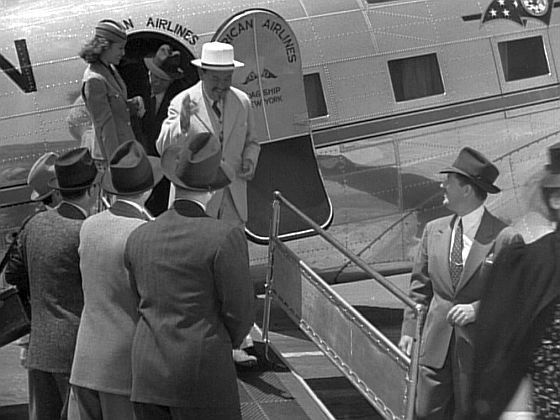 Greeted by the press and officials, Charlie Chan arrives in New York City in Murder Over New York (1940). WEEKLY CHAT/FILM VIEWING: Charlie Chan's Murder Cruise starring Sidney Toler with Layne Tom, Jr. who played three different Chan sons during the Charlie Chan film series, and whose birthday we will be celebrating later this month, while we discuss this film LIVE, watching it together via personal video! WEEKLY CHAT/FILM VIEWING: Charlie Chan at the Wax Museum starring Sidney Toler. Please join us as we discuss this film LIVE, watching it together via personal video! Keye Luke, who would portray Charlie Chan's number one son, Lee, in eleven films, was born in Canton, China, on this day in 1904. WEEKLY CHAT/FILM VIEWING: Phantom of Chinatown starring Keye Luke as James Wong. Please join us as we celebrate the birthday of Keye Luke and discuss this film LIVE, watching it together via personal video! WEEKLY CHAT/FILM VIEWING: Murder Over New York starring Sidney Toler. Please join us as we celebrate the birthday of Layne Tom, Jr. who played three different Chan sons during the Charlie Chan film series, while we discuss this film LIVE, watching it together via personal video! Layne Tom, Jr., who would play three different Chan sons in three different Charlie Chan films, Charlie Chan at the Olympics, Charlie Chan in Honolulu, and Charlie Chan's Murder Cruise, is born in Los Angeles, California, on this day in 1926.